Carrasco to make move to Arsenal? 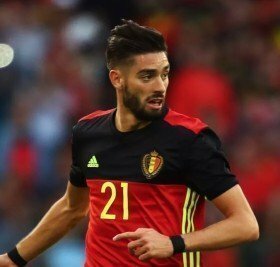 Arsenal manager Unai Emery is weighing up a move for Belgium international attacking midfielder Yannick Carrasco in the January transfer window. The impressive 25-year-old - currently playing in China for Dalian Yifang - wants to leave Asia and return to Europe and it is understood the Premier League is his preferred destination. Carrasco, who left Atletico Madrid for China last year, has 31 caps for Belgium and has scored 5 goals. It is understood Carrasco wants a new challenge and hopes to move to the Premier League, with a number of top clubs vying for his coveted signature. Man Utd were believed to be in pole position to sign the winger, but it is now understood Arsenal have jumped to the top of Carrasco's preferred transfer move list. Carrasco has a contract in China until 2021 but is hoping to break that deal in order to pursue a move to the Premier League. Emery is a huge fan of Carrasco, having watched his Sevilla side play against Carrasco's former club Atletico Madrid in La Liga over two seasons. It is understood the Chinese club is looking to recoup around 50 million USD from the transfer of Carrasco.